The paper, entitled "Making the Most of Wi-Fi: Optimisations for Robust Wireless Live Music Performance", will be presented at the 14th International Conference on New Interfaces for Musical Expression [NIME 2014] in London today [Wednesday 2 July]. 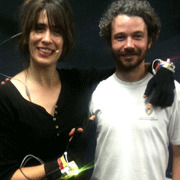 The enhanced musical gloves were used during a live performance by Imogen Heap last night at a concert to open the conference. Andrew Nix, Professor of Wireless Communication Systems and Head of the Department of Electrical and Electronic Engineering, said: "We have a world-leading Wi-Fi research group at Bristol and this project really caught our imagination. With help from Broadcom, Simon was able to modify a standard access point to ruggedise the link to and from Imogen's Wi-Fi gloves. It's fantastic to see one of our undergraduate students contributing so strongly to our research output." In future work, the researchers propose to rigorously evaluate the complete system (network infrastructure and antenna) in the context of 'real-world' performance scenarios. In particular, the research team are interested in examining the use of a Wi-Fi interface device called x-OSC as an enabling technology for collaborative live performance using a wireless sensor network.